Time management is not very difficult as a concept, but it’s surprisingly hard to do in practice. It requires the investment of a little time upfront to prioritise and organise yourself. But once done, you will find that with minor tweaks, your day, and indeed your week and month, fall into place in an orderly fashion, with time for everything you need to do. ‘Urgent’ tasks demand your immediate attention, but whether you actually give them that attention may or may not matter. 'Important' tasks matter, and not doing them may have serious consequences for you or others. Answering the phone is urgent. If you don’t do it, the caller will ring off, and you won’t know why they called. It may, however, be an automated voice telling you that you may be eligible for compensation for having been mis-sold insurance. That’s not important. Going to the dentist regularly is important (or so we’re told). If you don’t, you may get gum disease, or other problems. But it’s not urgent. If you leave it too long, however, it may become urgent, because you may get toothache. Picking your children up from school is both urgent and important. If you are not there at the right time, they will be waiting in the playground or the classroom, worrying about where you are. Reading funny emails or checking Facebook is neither urgent nor important. So why is it the first thing that you do each day? See our page minimising distractions to help you recognise and avoid other things that may distract you from getting your urgent and important tasks done. 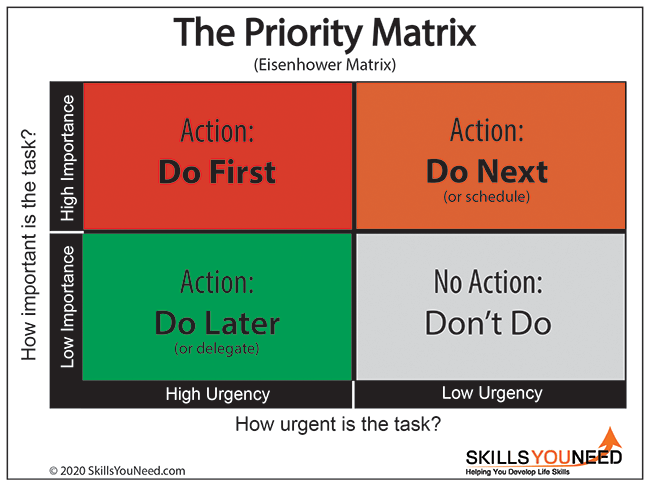 This distinction between urgent and important is the key to prioritising your time and your workload, whether at work or at home. Remember, too, that you and your health are important. Just because you have lots to do doesn’t mean that doing some exercise, going for a 10-minute walk or making time to eat properly is not important. You should not ignore your physical or mental health in favour of more 'urgent' activities. Urgency and/or importance is not a fixed status. You should review your task list regularly to make sure that nothing should be moved up because it has become more urgent and/or important. What can you do if an important task continually gets bumped down the list by more urgent, but still important tasks? First, consider whether it is genuinely important. Does it actually need doing at all, or have you just been telling yourself that you ought to do it? If it really is important, then consider delegating it. See our page on Delegating Skills for more. Jenny was the leader of a busy, highly reactive team, with constant and urgent demands on her time. She knew that she needed to spend some time thinking through the implementation of a particular policy, but it was very hard to set aside the time. 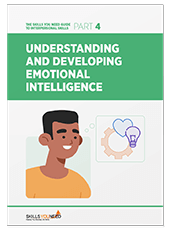 In a development discussion, Sara, one of her team, expressed her desire to do some more strategic work to build up her skills. Jenny saw an opportunity for both of them, and offered Sara the opportunity to prepare the initial paper on implementing the policy. Sara jumped at the chance, and produced an excellent, well-thought-through paper which was a great foundation for further work. For some of us, clutter can be both a real distraction and genuinely depressing. Tidying up can improve both self-esteem and motivation. You will also find it easier to stay on top of things if your workspace is tidy. If you have a system where everything is stuck on the fridge or notice board pending action, then take off anything that doesn’t need action and/or has been dealt with! That way, you’ll be able to see at a glance what needs doing, and you'll be less likely to miss anything. Create three piles: Keep, Give Away, and Throw Away. Keep, if you need to keep it for your records, or do something with it. If it needs action, add it to your task list. Give away, if you don’t want it, but someone else might be able to use it, and/or it is work that can and should be delegated. Throw away (or recycle) for things that have no value to you or anyone else. All of us have times of day that we work better. It’s best to schedule the difficult tasks for those times. However, you also need to schedule in things that need doing at particular times, like meetings, or a trip to the post office. Another useful option is to have a list of important but non-urgent small tasks that can be done in that odd ten minutes between meetings: might it be the ideal time to send that email confirming your holiday dates? If a task is genuinely urgent and important, get on with it. If, however, you find yourself making excuses about not doing something, ask yourself why. You may be doubtful about whether you should be doing the task at all. Perhaps you’re concerned about the ethics, or you don’t think it’s the best option. If so, you may find that others agree. Talk it over with colleagues or your manager, if at work, and family or friends at home, and see if there is an alternative that might be better. “I really must organise Jessie’s party. I’ve been putting it off for ages, and I won’t be able to find anywhere if I don’t do it soon,” Sally said to her friend Katy, as her four year old’s birthday loomed. “That sounds nice,” Sally said. The conversation moved on, but two weeks later, Katy had a phone call from Sally. Generally, people aren’t very good at multi-tasking, because it takes our brains time to refocus. It’s much better to finish off one job before moving onto another. If you do have to do lots of different tasks, try to group them together, and do similar tasks consecutively. Perhaps the most important thing to remember is to stay calm. Feeling overwhelmed by too many tasks can be very stressful. Remember that the world will probably not end if you fail to achieve your last task of the day, or leave it until tomorrow, especially if you have prioritised sensibly. Going home or getting an early night, so that you are fit for tomorrow, may be a much better option than meeting a self-imposed or external deadline that may not even matter that much. Take a moment to pause and get your life and priorities into perspective, and you may find that the view changes quite substantially!